He was born on17th March 1879 at Compton House, Trelwney Square, Flint. His parents were James Bowen and Sarah Elizabeth Evans. James Lloyd Evans was recorded on the 1881 census with his parents and younger brother, Frank Wallace. They had moved to live in James Street, Westgate, Northumberland for James Bowen Evan’s work as an Assistant Outfitter. James Bowen, 25 was head of the household, his wife Sarah Elizabeth was 28 They were in a flat/rooms or apartment at No. 17. James Lloyd was 2 and his brother Frank W. was 11 and ½ months old. The whole family had been born in North Wales. James Lloyd’s father died on the 1st February 1882 in Newcastle Upon Tyne and his brother, Frank Wallace died in the Queen’s Hospital, Birmingham of TB on the 3rd July 1890, aged 10. 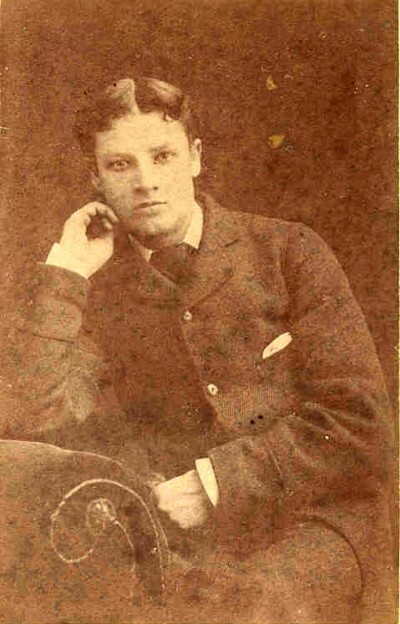 James Lloyd was a resident at Caerwys in 1897 (courtesy of Peacock-Ash Family Tree on Ancestry). The census of 1891 records that James Lloyd Evans was at the home of his father’s sister. She was Margaret Blythin of Bowen’s Cottage, Ffynonroyw, Llanasa, Flintshire. Her husband was Hugh, 38, a Colliery Banksman and their son was James E. Blythin aged 8. 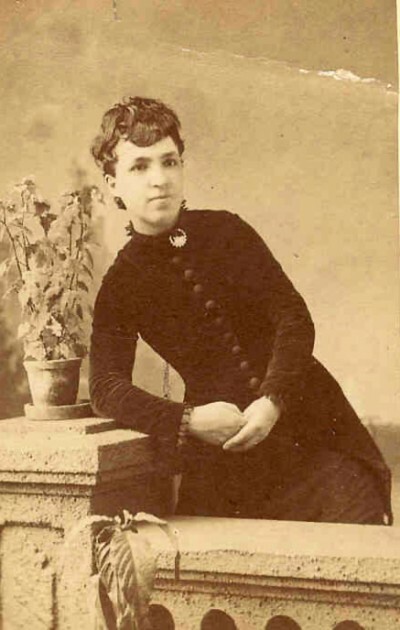 James Lloyd Evans, her nephew was 12. He returned to Wales for his marriage in 1904 and married a Mold girl, Edith Eleanor Price in 1904 at the Bailey Hill Chapel in Mold. They settled in Mineota, Manitoba Canada. When he enlisted for the first World War in December 1914, he stated that he was a hardware and lumber merchant. The couple had three children Frank Lloyd b 1906, Gwladys Eleanor b 1909 and James Eric b 1914. When war broke out James Lloyd Evans answered his homeland’s call and enlisted on the 29th December 1914 at Winnipeg. His rank was Captain. Jim’s war is charted in great detail in his correspondence with his wife and children. He left Canada and spent time in the UK with his regiment before eventually going to the Western Front where he lost his life. During his waiting period in the UK he returned to Flintshire to visit old friends and family members in Mold. He writes to his wife in Canada about these visits. 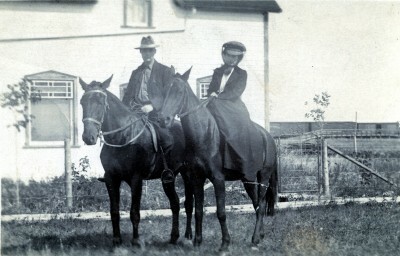 The family made the decision for Edith Eleanor and the children to leave Canada and return to Wales for the duration of the war. She rented a cottage in Gwernaffield and the children went to school locally. The correspondence continued between James in France and his family in Gwernaffield until the last fateful letter was sent informing his wife of his death. Edith returned to Miniota, Manitoba between 1919 and 1929 and died on the 25th February 1969 at the Peel Memorial Hospital, Port Credit, Ontario, Canada. Several photographs of James and many, many copies of his letters are accessible on line at the ‘Canadian Letters and Images Project’. 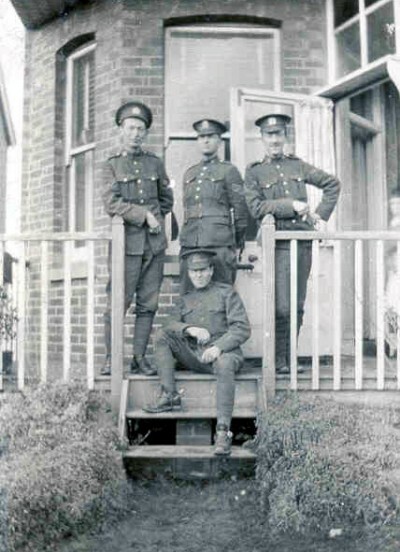 This is an on-line archive of the Canadian War experience. http://www.canadianletters.ca/search/site/James%20Lloyd%20Evans?page=1 It began in August 2000 and is located at the Dept of History at Vancouver Island University. Follow the links – and give yourself a couple of hours at least to browse this wonderful archive. Although I was born in Miniota, Manitoba, my first memories are of England, albeit rather vague ones. 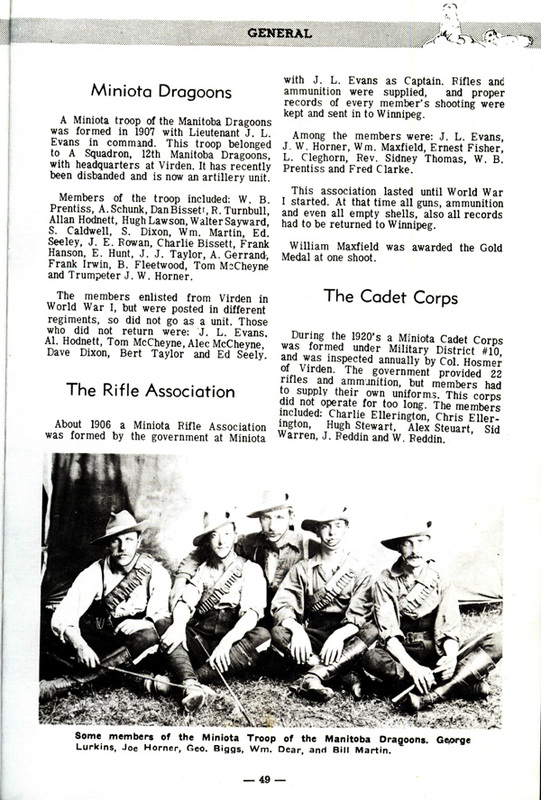 Shortly after my birth in 1914, war was declared in Europe and my father, who was O.C. [i] of the Miniota branch of the XII Manitoba Dragoons, enlisted for overseas service and was soon shipped over to England. My mother followed him to England in late 1915, but not without some difficulty. She had obtained passage to England on a ship sailing from New York. Just before leaving she learned that a new regulation had been passed requiring that all passengers overseas have a valid passport. This was a wartime measure not previously required. As Mother had no passport and as the time left before her departure was insufficient to acquire one, she consulted the town magistrate, Gilbert Rowan, who supplied her with a document certifying that she was indeed a British subject and we, my elder brother, Frank, and sister, Gwladys, and I, were her children. The document included a certified picture of all of us. Thus armed we left for New York. At the embarkation pier in New York, Mother, presented her document and was told that it was insufficient and that she should get approval from the Consulate. Gwladys, my sister, tells me that Mother left me with someone at the pier, then with her and my brother Frank in tow, Mother headed for the Consulate. There she found a long line-up and knew that if she waited her turn, the ship would have sailed before she returned. So she returned to the pier. Once more she approached immigration, but now a different officer was on duty. She presented her document, he studied it, paused, then stamped it. We were on our way. My recollections of Wales are dim. I seem to remember my 4th birthday party on May 25th, but this may have been supplemented by a picture in the family photograph album. My father was killed in France on September 1st, 1918. I remember my mother’s grief when she received the telegram which arrived on Friday the 13th, her Celtic superstitiousness thus tragically reinforced. I can recall only two further incidents; the first was eating chip potatoes from a newspaper cone purchased from a vendor’s wagon. The second was on board ship prior to sailing. We were gathered in our cabin with relatives who had come to see us off. I was fascinated by buttons by the door and pressed one which summoned the steward. Someone told me that if I did that again, I would be thrown overboard. I was frightened enough that the memory has stayed with me. We returned to Canada in January or February, 1919, travelling by train from Halifax to Miniota. I recall that it was very cold and I experienced my first snow. We were met by my Uncle Jack [Taylor] with sleigh and horses and driven to the farm. 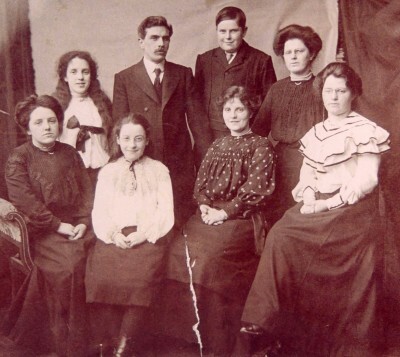 There I met my Aunt Gwladys and four cousins — Lloyd, Gwen, Kathleen and Eira the baby. A fifth cousin, Jim, named after my father, was born in 1921. We stayed at the farm until our home in Miniota was made habitable after being empty for four years. In the years following, out of a sense of duty, Mother always attended Remembrance Day services although she hated them. It’s the only time I remember her weeping. April 2014 The following e mail from family member Susan Evans Shaw was received adding further insight to Jims’s story. We post it here in full. I had a look at the link and you have most of the facts right. There are, however, a few corrections. He was a member of the Denbighshire Hussars not Derbyshire. 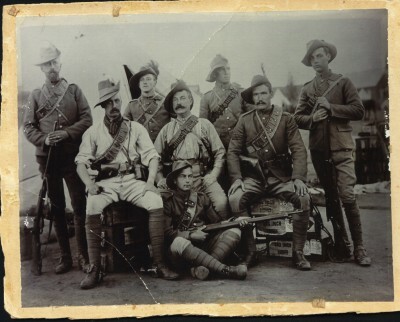 At the time of the Boer War, the Denbighshire Hussars were incorporated into the Imperial Yeomanry. In fact, Jim Evans (he was always known as Jim) never got to fight in South Africa. His unit spent the first months at Cape Town guarding lines of communication. When, in December 1900, they were moved into the field around Johannesburg and Pretoria, Jim stayed behind in the infirmary as he had contracted enteric fever/typhus due to the lack of sanitation in the camps. 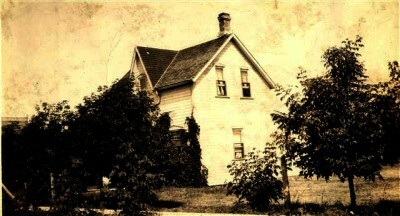 At the end of April 1901 he shipped home. 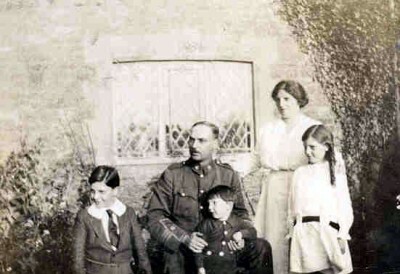 Edith Eleanor and the children traveled to England in December 1915. They first lived at Hythe while Jim was based at Shorncliffe, then moved to Godalming in 1917 when Jim was transferred to Witley Camp. 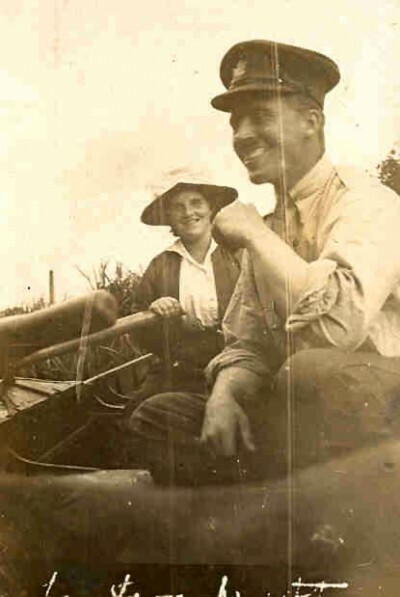 Only after Jim left for France did Edith move to Gwernaffield to be near her brother, Will, and his wife, Eunice. Eric was too young for school, Gwladys attended local schools in each community and Frank attended CharterhouseSchool. 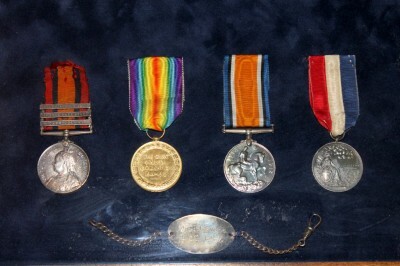 After Jim was killed, the family remained in Gwernaffield until February 1919 then returned to Canada. In the years Jim was in England he rose in rank to Major but took a drop in rank to Captain in order to serve at the front. After his death Edith fought the military to receive the pension of a Major’s widow. She won eventually but it took many years. The anthology with the story of Jim and Edith will be published either this summer or in the fall. I can send a copy if you like. I shall have to find out who Neil Poole and James Knight are. The names ring a very faint bell. The photos look terrific. If you want any more I have plenty. 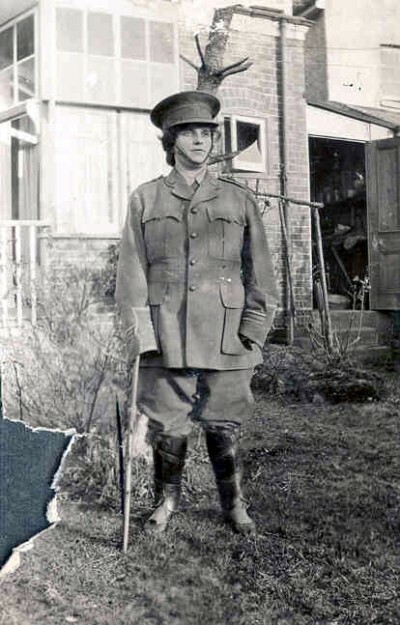 There’s a sweet one of Edith dressed in Jim’s uniform. Reverse of his notebook. He used this aspect of the notebook for his training notes. James Lloyd is listed on the Gwernaffield Memorial where they ‘promoted’ him (with some justification) to Major. He is also listed on the Ffynongroyw Memorial.